This class has already SOLD OUT!! When Kimber gets back from maternity leave she will be hosting more cooking classes. Be on the lookout! I'm sure by now you have figured out that Kimber and I are all about that holistic, non toxic life. We are asked all the time for recommendations, remedies, what we use etc. So we wanted to get everyone together and share all of our natural wellness tips and tricks. 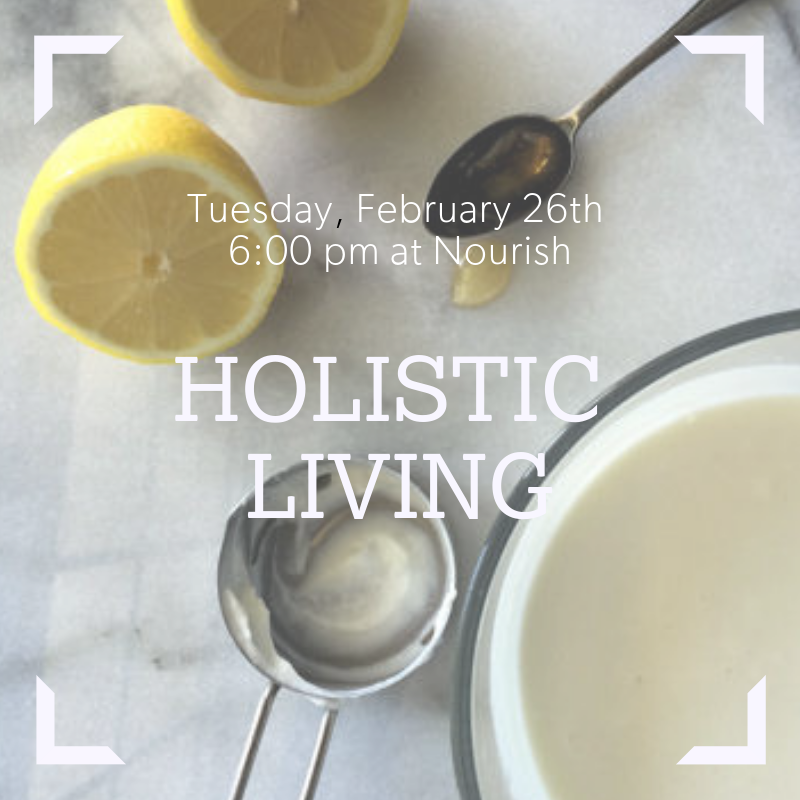 During this event we will be sharing brands that we use and trust, giving you homemade beauty and cleaning recipes (you will make your own mask to take home), learn how we keep our immune systems healthy, what we do whenever someone in our family is sick, how we detox, what we incorporate in our daily routines etc. We will also be tasting bone broths, kombucha, the detoxifier and other fun wellness treats. From beauty, cleaning and wellness we want to share what we love and how to keep toxic, synthetic chemicals OUT of your home and body. email kalle@nourishcafemarket.com to reserve your spot! I tell everyone I know how important it is to make the switch to natural wine. I actually can't believe it took me so long to learn about it and how terrible mass produced wines are for our health. Hello hangover. The natural flavor, color and growing cycle of wine should be driven by nature. But in order to capture sameness and establish predictability, producers of commercial wines rely on pesticides, chemical additives and sugars, which yields a product that tastes the same, bottle after bottle, year after year, it maximizes yields and hides flaws that may exist in those bottles. Unfortunately, this processed wine is chemically-altered and completely unnatural, and you can taste it. Just as your palette changed when you switched to eating whole foods and processed foods began to lose their luster, the same is true for wine. Mass produced wine will not only give you headaches they will start to taste terrible. Scout and Cellar only selects wine from vineyards that are grown naturally—without the use of synthetic pesticides—and bottled consciously—without added sugars or non-organic chemicals. 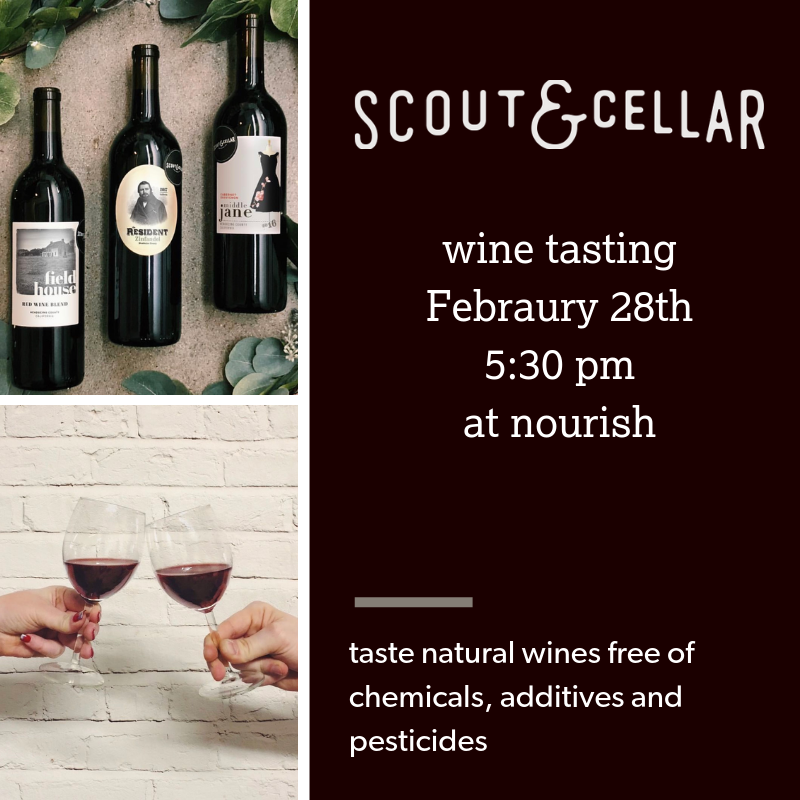 Nema Velia is a rep for Scout and Cellar and she will be hosting a wine tasting on the 28th. I can't tell you how game changing this is for your health if you enjoy drinking wine. Step up your wine game and join us! RSVP to kalle@nourishcafemarket.com if you will like to attend.